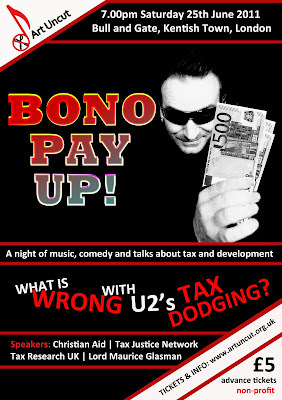 U2 heads the line up at Glastonbury festival this weekend and the stage is set for Art Uncut's events targeting their tax dodging. Away from Glastonbury, at the Bull and Gate in Kentish Town, London, Art Uncut in conjunction with Big Society Entertainments is organising an evening of comedy and debate in support of the Fortnum & Mason 145. The comedians will be supported by a line up including TJNs very own stand-up economist, John Christensen, Lord Maurice "Blue Labour" Glasman, plus speakers from Christian Aid and Art Uncut.